Skipping useless intros and preludes, Decadence's "Chargepoint" begins with the energetic "Discharge" raising hell in its first ten seconds of music. It's here that the newest addition to the ranks of harsh female screamers introduces her venomous snarl. The blonde goddess Kitty Saric, whose musical partnership with her ever reliable axeman Kenneth Lantz is responsible for a growing discography of strong material dating back to their 2005 self titled debut, has steered Decadence past a few ugly hiccups (a long tiem rhythm guitarist recently quit) and into the band's latest career plateau, this brand new "Chargepoint." The cover: a laser beam incinerates a fantastical barrier, a fitting representation of Decadence's single minded determination to strive for greater success. While prescience rarely has a place in music reviews, one is tempted to contemplate whether these thrash troopers will soldier on through the years like Amon Amarth, becoming that rare unit who actally get better with age. 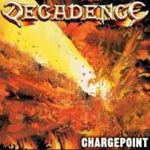 But "Chargepoint" gives no indication of Decadence's longevity, which remains a tricky thing for bands in general. What it does provide are nine burning tunes that thrash the limp noodles polluting your current playlist. With the new Megadeth having made its mark and Nevermore's comeback album still a few months away, "Chargepoint" is that rare independent release that will turn heads for its unrelenting energy and no-nonsense approach to metal. Once opener "Discharge" sets the album's pace with its spitfire delivery, "Silent Weapon (For A Quiet War)" comes around wrapped in exquisite guitar play and hooks. Both "Out of Ashes" and "Point of No Return" keeps "Chargepoint" from getting redundant, while "Strength of Mind," "Fast Forward" and "Challenge" literally ooze the band's positive message. As frontwoman Kitty Saric likes to say on interviews "Where there's a will, there's a way." It's the mono-maniacal attitude behind such a mindset that drives the band's less-than-nihilistic lyrical themes. The last song "Be Home When I'm Gone" betrays a little feeling before a closing instrumental caps off Deacdence's latest with fireworks. Without a doubt an impassioned release, more critical metalheads will loath the album's lack of memorable tunes, but if you want more than the usual melo-death from Sweden, Decadence are worth listening to. Without a doubt an impassioned release, more critical metalheads will loath the album's lack of memorable tunes, but if you want more than the usual melo-death from Sweden, Decadence are worth listening to.